In a setback to his alleged efforts to bring money stashed abroad, Prime Minister Narendra Modi is unlikely to sign a deal on data sharing during his to Switzerland on June 6. Reporting this, a top Swiss media organization has said, the trip comes when "Switzerland is under great pressure to share banking information with India." 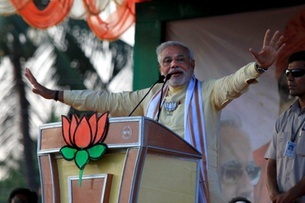 A report published in swissinfo.ch -- the international service of the Swiss Broadcasting Corporation (SBC) -- says, this would happen despite the fact that "even before being elected prime minister in 2014, Modi saw the political potential in raising the issue of untaxed income stashed abroad by Indians." The report quotes a spokesperson for the State Secretariat for Financial Affairs as saying, “We have not been informed that any agreement will be signed.” The report comments, "For now, it is likely that Modi must content himself with a view of the Swiss Alps." One of the most authoritative media houses of Switerland, SBC's international partners include Radio Netherlands Worldwide, Radio Sweden, Radio Canada International, NHK World, Radio Praha and Polskie Radio. The report says, the setback will come when "questions are being raised about (Modi) government’s commitment to punish financial wrongdoers." It adds, "Therefore Modi is under significant pressure to show something for his Swiss stopover. However, this is unlikely to happen." Recalling how barely three months after joining Twitter in 2009, Modi initiated a nationwide poll on bringing back black money (untaxed assets) from Switzerland, the report says, "Bringing back black money squirreled away in Swiss banks by Indian tax dodgers, was one of the pillars of his election campaign in 2014." "He utilised it with great effect to discredit the ruling Congress party and raise hopes of achieving what others had failed", the report says, adding, "However, Swiss banking secrecy and limitations of bilateral treaties have frustrated his government’s efforts in delivering the promises." According to the report, "India has been looking into 782 names taken from a list of HSBC bank clients given to foreign authorities by former employee, Hervé Falciani, who worked at the bank’s Geneva branch. Despite pressure from India, Switzerland had refused to compromise on its stance of rejecting requests for banking information that are based on stolen bank data." "The change in the Swiss stance towards Indian HSBC clients comes at a time when it is under intense OECD scrutiny to respond to requests for information", the report says, adding, achieving global standard of tax compliance "will help Switzerland be seen as taking money laundering and corruption seriously and cement its position as a safe place to do business." "Beginning the latter half of this year, a Peer Review Group (PRG) comprising 30 countries will evaluate Switzerland’s performance over several months. India happens to be one of four vice-chairs of the PRG and will likely wield considerable influence, especially when it comes to the issue of stolen data", the report says. "Refusal to entertain any information requests from India, even when they are based on stolen data, could potentially cost the Swiss their chance to clear Phase 2 and meet the OECD’s global standard on tackling tax evasion", the report says. Modi, will no doubt be hoping to get India into this list as soon as possible. But this is a time-consuming process as each country deal has to be approved by both houses of the Swiss parliament. It is unlikely that any deal will be inked during this visit.